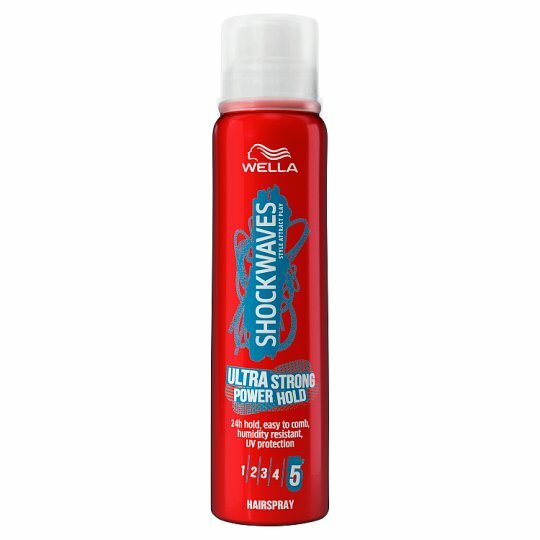 Shockwaves Ultra Strong Power Hold Hairspray 250ml is a strong hairspray with excellent protection against UV and humidity. Our ultimate solution for anyone who needs a finishing spray that can help to fix and hold a hairstyle. This product is a strong hairspray with the power to fix and hold the style you created. Want a long-lasting styling solution for your hair? Ultra Strong Power Hold offers up to 24 hours of hold and yet is incredibly easy to brush out once you are ready for a new hairstyle. It will protect your hair from UV rays and won't leave any sticky residue once it dries. This hairspray is ideal for a strong hold on all styles and all types of hair. Wella Shockwaves, style the moment, your style, your moment, your way. For more volume spray to the roots with head upside down. Danger Extremely flammable aerosol Pressurised container: May burst if heated. Keep away from heat, hot surfaces, sparks, open flames and other ignition sources. No smoking. Do not spray on an open flame or other ignition source. Do not pierce or burn, even after use. Protect from sunlight. Do not expose to temperatures exceeding 50°C. Keep out of reach of children. Do not inhale intentionally. The can must be completely empty before disposal. Use exclusively for intended purpose. Do not spray onto the eyes.